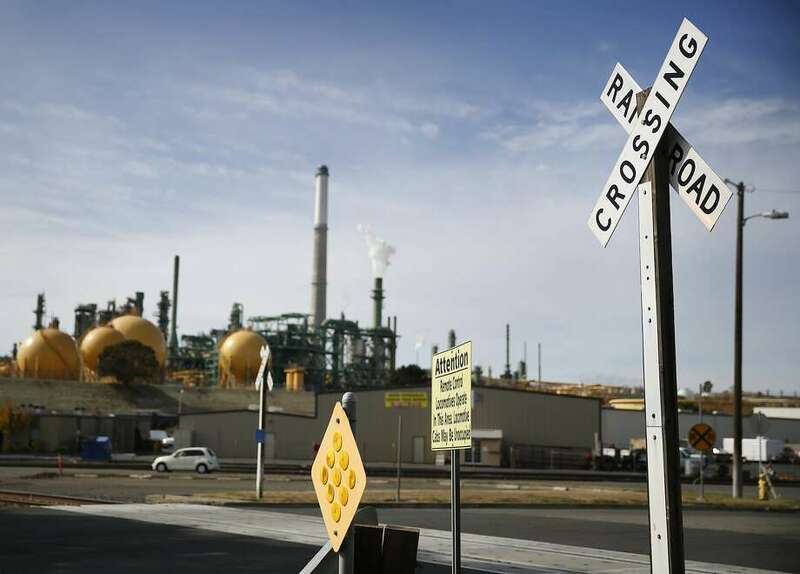 History, or at least precedence, was made Tuesday evening when the Benicia City Council denied Valero a land use permit to bring in volatile Bakken and Tar Sands crude oil from North Dakota and Canada by train. In what appeared to observers to be a stunning change of heart, the council unanimously agreed with the Planning Commission’s earlier recommendation to reject Valero’s project permit. With other Northern California cities —and San Luis Obispo—watching carefully, the council’s action set a precedent and reaffirmed a city’s right to regulate local land use and protect the health and safety of its citizens. The decision may have marked the first significant rejection by a California small town of a fossil fuel company’s proposed major business expansion, and probably notes the diminishing power of the industry in local and state politics. Interestingly enough, the most prominent rejection by a small town of an oil company’s intended expansion occurred in Denton, Texas. Denton, a quiet and prosperous suburb of Dallas, in the middle of America’s oil patch, banned fracking (a method of shale gas extraction that uses large amounts of water pumped at high pressure into channels drilled into rock to release gas) within the city limits in 2014. Benicia council’s decision has signaled the city’s first steps away from its past dependence on the fossil fuel industry and its Company Town identity, and marks a tentative step toward a new reality. While local, the decision was significant and reflects the growing momentum of the megatrend known as the Green Industrial Revolution, which is replacing carbon dependent economies with those powered by renewable energy. Despite the decision, and for years to come Benicia’s tax revenue will still be highly dependent on fossil fuel, and so the developments of the Green Industrial Revolution with its twin drivers of carbon emission reduction and non-carbon energy expansion will have enormous consequences. As the Green Industrial Revolution expands, it will lead to the decline of the fossil fuel industries and correspondingly to the reduction of Benicia’s tax base and carbon-dependent economy. Here are some other recent events furthering this expansion, and while not local, all have a bearing on Benicia’s future. The first event happened at the recent G20 meeting in Hangzhou, China. The G20 meeting, which occurs annually, brought together the world’s 20 major economies to discuss international problems and potential policies and solutions. Leaders from the U.S., the European Union, China, Japan and Russia among others, came together for the two-day summit. Next year’s meeting is in Germany. Woodrow Clark, my writing/business partner, is a member of the B20, a G20 subgroup that focuses on international business and economic issues. As a member of the group that delivered a policy report at the Hangzhou meeting, Woody had a front row view of the historic G20 meeting. Among the policy discussions that the meeting generated, there were some remarkable initiatives. One was that Russia agreed to join the US and China, along with the EU in addressing climate change. I imagine that India will also commit to GHG reductions next year at the G20 meeting in Germany. A second development was also part of the G20 meeting and featured the showcasing of a remarkable chemical breakthrough by Eneco Holdings, LTD, from Japan. The company has the potential to be one of Asia’s largest energy companies with their development of a nano-emulsion technology. It appears that the company has succeeded in making a “complete fusion” between water and oil through the ultra-miniaturization of components at the molecular level. In simple terms, they have succeeded, where all others have failed, in mixing water and oil into a combustible fuel. The result is a mixture that is 70 percent water and stable enough to be a used in internal combustion engines. Further, it is safe and environmentally friendly, emitting about half the carbon, nitrous oxide, and sulfur dioxide released in traditional internal combustion gasoline and diesel combustions. Additionally, when produced in large quantities it will be significantly cheaper than conventional gasoline and diesel. Originally produced for the Japanese market, Eneco’s Plasma Fusion fuel is being tested and used in China and other parts of Asia. With clean emissions levels, it is ideal for the heavily polluted Asian megacities, and should rapidly grow into a viable alternative to conventional gasoline and diesel. Just imagine how healthy West Oakland’s port area would be without its diesel contaminates? Regardless, this emulsion fuel will be a transitional fuel to hydrogen powered vehicles. The third development that will have a significant impact on the fossil fuel industries is the continual plunge in the price of solar panels. Last week at a meeting, a solar developer told me that panel prices are now the lowest they have ever been in California, plus they are functioning at their highest levels of efficiency. Driven by the economic principle of Zero Cost Margins—once the equipment is paid for, the rest of the energy is free—solar and renewable energy are expanding at the rate of Moore’s Law, or doubling about every 18 months. Developing and developed nations are rapidly adopting renewable energy, mostly wind and solar, as a replacement for fossil fuels. In about 20 areas in the world, particularly in Asia, solar and renewable energy are less expensive than fossil fuel. Even Saudi Arabia and United Arab Emirates are developing large solar power generation sites. Because of Russian aggression and threats of shutting off the natural gas supply, Europe has accelerated its transition from fossil fuel and atomic energy to wind and solar. Germany is a major user of solar energy despite the northern climate, and the United Kingdom is building the world’s biggest offshore wind farm called Hornsea off the Yorkshire coast. Hornsea will be the world’s first offshore wind farm to exceed 1 GW in capacity and will produce enough energy to power well over 1 million homes. Closer to home, the United States’ Pacific coastline has enough wind and tidal resources to power most of the nation’s needs, and by adding solar to the mix, the U.S. could easily generate enough electricity for centuries to come. Roughly speaking, wind power costs about 2 to 4 cents per kilowatt hour and solar about 5 to 6 cents. PG&E charges around 22 to 24 cents per kilowatt hour, so it’s just a matter of time before on-site or distributive energy overtakes traditional energy delivery. Further, the carbon industries and the large central utilities have flawed business models that are dependent on ever increasing growth and they cannot adapt to the lower prices available from renewable energy, or the increasing efficiency of vehicles and buildings. This is why Clark and I have written extensively on energy cost deflation and the shrinkage and decline of the carbon industries and the large central utilities. Finally, we come to Sept. 8’s monumental signing by Gov. Jerry Brown of Senate Bill 32, the legislation that has catapulted California into a leadership role of the international efforts to slow global warming. SB 32 will force the state’s trillion-dollar economy, one of the biggest in the world, into a much smaller carbon footprint. In fact, the legislation requires the state to slash greenhouse gas emissions to 40 percent below 1990 levels by 2030, a much more ambitious target than the previous goal of hitting 1990 levels by 2020. Cutting emissions will affect nearly all aspects of our lives, accelerating the growth of renewable energy, prodding people into buying electric autos, and pushing developers into building denser communities connected to mass transit. (Details: http://www.latimes.com/politics/la-pol-ca-jerry-brown-signs-climate-laws-20160908-snap-story.html ). One other key element to California’s pursuit of clean air and reduced greenhouse gases is the state’s cap-and-trade program. The program requires the state’s heavy polluters to buy carbon offsets, or credits, to release emissions into the atmosphere, creating an additional operating cost for the oil and utility industries. SB 32 and the expansion of cap-and-trade will have dramatic impacts on the state’s fossil fuel industries. Likely many of us are driving our last conventional gasoline powered vehicle, with the next one probably powered by electricity or hydrogen. It’s not hard to predict that since the Bay Area’s refineries are the heaviest of the area’s polluters, that the combination of reduced revenue from shrinking demand and increased costs of production and operation will eventually lead to refinery closings. The fossil fuel industries won’t give up easily, there’s trillions of dollars at stake. Many of the industries leaders and the more prescient investment bankers know that the fossil fuel era has peaked and started to decline, which is why Russia overran the Crimea and is poised to take over Ukraine. Which is why the U.S. and Canada are being besieged by the fossil fuel interests to ignore or eliminate environmental and safety protections that hamper production. Which is why Valero pushed so hard to transport volatile Bakken crude by rail cars through the densely populated Sacramento corridor and cram the trains into Benicia and a refinery that is not designed or equipped to deal with them. The industries, the refineries and all connected to the fossil fuel era, know that the incredibly lucrative period when oil was king and black gold flowed from the sand is coming to an end. Bringing this back to Benicia, we see a city that is dependent on Valero for tax revenue and its governing process glimpsing a new reality. Small cities like Benicia that have been so dependent on the fossil fuel industries for so much and for so long, struggle to change. Other cities like those in the deindustrialized Midwest that have suffered sudden collapses of their major companies and tax bases have had to reinvent their economic drivers or just blow away. But it’s hard for a city like Benicia with its apparent prosperity and ease of living to understand that its fossil fuel base is in decline and that the future is elsewhere. Grant Cooke is a longtime Benicia resident and CEO of Sustainable Energy Associates. He is also an author and has written several books on the Green Industrial Revolution. His newest is “Smart Green Cities” by Routledge. According to an Energy Transfer Partners, L.P. (ETP) website, ETP and Sunoco Logistics Partners, L.P. announced they had signed an agreement to sell 36.75% of the Bakken Pipeline Project to MarEn Bakken Company, LLC. Marathon Petroleum Corporation and Canada based Enbridge Energy Partners, L.P. jointly own MarEn Bakken. Marathon Petroleum and Enbridge paid $2 billion in cash for the minority share of the Dakota Access Pipeline (DAPL) and its sister pipeline, the Energy Transfer Crude Oil Pipeline (ETCOP). The DAPL consists of approximately 1,172 miles of 30-inch diameter pipeline from western North Dakota’s Bakken oil production region to the petroleum storage hub at Patoka, Illinois. The ETCOP is roughly 700 miles of existing, 30-inch diameter pipeline already converted from carrying natural gas to carrying the light sweet Bakken Crude oil. That converted pipeline starts at Patoka and terminates at Nederland, Texas near Houston. Energy Transfer said the sale to Marathon Petroleum and Enbidge is to close in the 3rd quarter of 2016 and it’s subject to certain closing conditions. ETP will receive $1.2 billion and Sunoco will receive $800 million in cash when closing is finalized. Energy Transfer said they plan to use the proceeds from the cash sale to pay down debt and to help fund their current growth projects. Energy Transfer/Sunoco will own 38.25% of the DAPL. MarEn will own 36.75% and Phillips 66 will continue to own the remaining 25%. Energy Transfer will continue to oversee the ongoing construction of the approximately $3.8 billion pipeline project. Once the pipeline becomes operational later this year, Sunoco will be responsible for day-to-day operations of the pipeline. A large subsidiary of Marathon Petroleum has already committed to participate in this upcoming open season and will make a long-term commitment to ship a large volume of Bakken crude oil to the Patoka petroleum hub. Enbridge owns crude oil storage tanks at Patoka and existing pipelines that go in to and out of this vital petroleum transshipment hub. When ETP proposed the DAPL back on June 25, 2014, the pipeline was designed for transporting 320,000 barrels of light sweet Bakken crude oil per day. Energy Transfer said that they would solicit additional shipper interest to increase the daily flow rate. Additionally, Energy Transfer said they were in discussions with Sunoco to seek their participation in a potentially significant equity partnership. Then on September 22, 2014, Energy Transfer announced that they intended to initiate an Expansion Open Season to acquire additional crude oil transportation services on the DAPL. This Expansion Open Season was successful when additional shippers signed long-term commitments increasing the daily throughput to 450,000 barrels per day. With the pending ETP open season in the coming weeks, this anticipated flow-rate increase of upwards of 570,000 barrels per day will result in the DAPL moving a substantial volume of the daily crude oil produced from western North Dakota’s Bakken/Three Forks petroleum production areas. According to the North Dakota Bakken Daily Oil Production News website, the daily production level of Bakken crude oil stood at 994,727 barrels per day as of May 31, 2016. This is a small increase from the previous month. However, both production figures are down significantly from June 30, 2015 when the Bakken oil field was producing at the rate of 1,153,000 barrels per day. The Bakken oil fields had been yielding almost 1,200,000 barrels per day in 2014 when prices for crude oil were much higher than today. The U. S. Energy Information Administration (EIA) recorded a price for crude oil at $105 per barrel in June of 2013. It was in July of 2014 when oil prices dropped below $100 per barrel. One year ago, in June of 2015, the EIA reported a price per barrel of around $60. Earlier this year, in February, the price per barrel plunged to just above $26 per barrel. Today’s price per barrel is around $40 and still expected to fall more. The daily production rates for crude oil in the Bakken oil fields are rising and falling right along with the fluctuating prices for crude oil and will continue to due to the current over-supply of crude oil in the world oil markets. Currently, almost 100% of the 944,000 barrels of crude oil produced daily from western North Dakota oil fields moves out over the U.S. railroad system. That is because there are no significant crude oil pipeline systems originating from the Bakken region currently available for moving this huge volume of light sweet crude oil into the broader U.S. pipeline distribution system. Once the 600,000 barrel per day DAPL begins commercial operations later this year, it will be the first major pipeline to move Bakken crude oil. However, that still leaves about 400,000 barrels per day for railroad shipment. A 100-car Bakken crude oil unit train can carry about 3,000,000 gallons of oil. According to North Dakota statistics, Burlington Northern & Santa Fe Railroad (BNSF) hauls out about 75% of the crude oil that leaves the Bakken region. Union Pacific and CSX Corporation are other rail carriers that move Bakken crude oil. Some Bakken crude oil goes north into Canada and is moved east or west to crude oil refineries located as far east as Nova Scotia. The most recent crude oil unit train derailment happened on June 3, 2016 when a 96-car Union Pacific unit train carrying Bakken crude oil derailed while moving through the Columbia River Gorge near Mosier, Oregon. Fourteen of the tanker cars derailed, ruptured and caught fire. Approximately 42,000 gallons of crude oil spilled. A federal investigation revealed that broken bolts joining two rails caused the accident. The Iowa Homeland Security and Emergency Management Department tracks how much Bakken crude oil moves through Iowa. According to figures from early 2015, BNSF moves Bakken crude oil through Iowa on one heavily used route through Lyon, Sioux and Plymouth Counties and into eastern Nebraska. Another heavily used BNSF route crosses southern Iowa. When daily North Dakota crude oil production rates peaked in 2014 and 2015, roughly 12 to 18 crude oil unit trains per week used the two BNSF routes. The Association of American Railroads did a study of U. S. Rail Crude Oil Traffic in November of 2015. Their summary noted; U.S. crude oil production has risen sharply in recent years, with much of the increased output moving by rail. In 2008, U.S. Class I railroads originated 9,500 carloads of crude oil. In 2014, they originated 493,146 carloads, an increase of nearly 5,100 percent. Rail crude oil volumes in 2015 will be lower than in 2014. Additional pipelines will probably be built in the years ahead, but the competitive advantages railroads offer–including flexibility to serve disparate markets–could keep them in the crude oil transportation market long into the future.